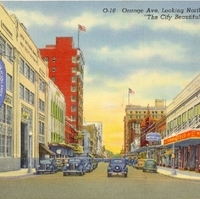 Postcard showing a bird's eye view of Orange Avenue in Orlando, Florida. The cross street in the foreground is Church Street. On the west side of Orange Avenue at the corner of Church Street is the First National Bank Building, located at 190 South Orange Avenue. The bank was constructed between 1929-1930 and designed by Howard M. Reynolds in an Egyptian Revival style, covered in terra cotta with Art Deco-style false columns designed to look like sheaves of wheat. The building cost $300,000 to construct and opened on March 24, 1930.From 1929 to 1960, the building was occupied by the bank. Starting in the mid 1980s, it became Valencia Community College's Downtown Campus. On the east side of the street is the Woolworth Building at 101 South Orange Avenue. Constructed in 1924, the building was built for $100,000 by Franklin J. Mason and was opened in July 1924. The building was occupied by the Woolworth Store from 1924 until 1989, and then by Terror on Church Street, a Haunted House attraction, in the 1990s. This block, which includes the McCrory's Store, was demolished in January 2004. The Woolworth Store replaced the Guernsey Hardware building at 101 South Orange, which was constructed circa 1881 and demolished in 1924. Guernsey Hardware as originally the Cassius A. Boone Hardware Store. Boone operated his hardware store along with his partner, William A. Patrick. In 1895, the building and the stock was purchased by Joseph L. Guernsey. Boone chose to go into the citrus industry instead of running a store. Guernsey Hardware operated in the store until 1922. 0-16--Orange Ave. Looking North, Orlando, Fla. "The City Beautiful"
Orlando, located in the heart of the Florida peninsula, is the largest inland city in the state. Scores of sports, excellent theatres, stylish shops are offered in this progressive, modern and healthful resort. Genuine Curteich-Chicago. “Orange Ave. Looking North Postcard.” RICHES of Central Florida accessed April 25, 2019, https://richesmi.cah.ucf.edu/omeka/items/show/1002.